Several thousand people massed outside the Greek legislature, some of them chanting “traitors” as lawmakers debated ratification of an agreement reached with the neighbouring ex-Yugoslav state last year. The Greek parliament delayed the expected approval of the UN-brokered deal by a day due to an increased number of lawmakers who wanted to have a say over it. The so-called Prespa Agreement between Athens and Skopje changes the tiny Balkan nation’s name to Republic of North Macedonia, ending a 28-year-old row between the two countries. “We are one step before a historic event,” Prime Minister Alexis Tsipras said, calling on lawmakers to approve the deal. Although Tsipras appears to have secured the support of at least 151 deputies in the 300-seat house to get the deal approved, opinion polls have shown most Greeks oppose the term “Macedonia” being used in any agreement. They fear it could lead to territorial claims over Greece’s largest northern province of Macedonia and an appropriation of Greek cultural heritage. The deal could unblock Macedonia’s bids to join NATO and the European Union, long blocked by Greece. The accord has already been ratified by Macedonia’s parliament, but still needs Greek parliamentary endorsement. Outside parliament, protesters chanted “Long live Macedonia, long live Greece!” referring to the Greek province of Macedonia. Police chased protesters on Syntagma Square, the same area of large, violent protests in Athens on Sunday. 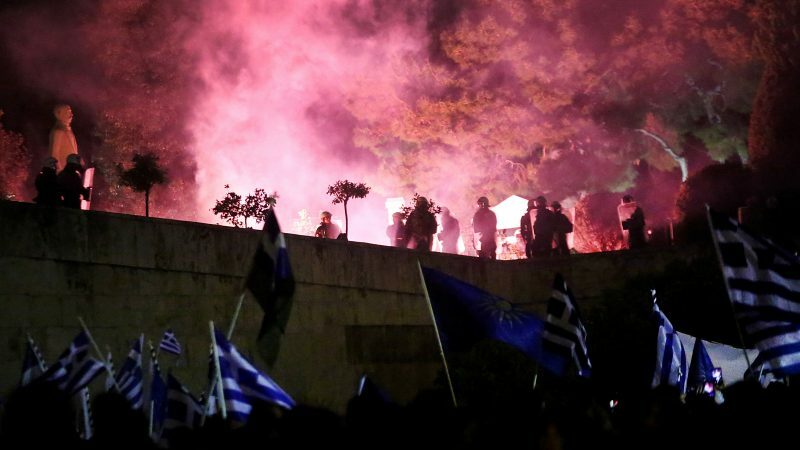 They later detained dozens of them and a group of people who sprayed “Macedonia-Greek land” on a wall near the US ambassador’s residence in Athens, a police official said. There were also protests in the northern Greek city of Thessaloniki and other cities. Parliamentary speaker Nikos Voutsis said close to 230 MPs had wanted to have their say. Most are given six minutes to speak, a rule which has been routinely broken in the highly charged session, which opened on Wednesday. Protesters were planning new rallies for Friday, before the vote takes place around 1230 GMT.